Sylvia Center volunteers and staff attended a training for Slice Out Hunger, the city's biggest annual pizza party featuring $1 slices from over 50 of NYC’s best pizzerias. The enthusiasm in the room was infectious, as volunteers shared a love for pizza and ending hunger in New York City. With 100% of the proceeds benefiting The Sylvia Center and City Harvest, this delicious event is sure to be a success. To learn more, check out (slice out hunger website); if you'd like to volunteer, please email events@sylviacenter.org by September 21. On the final week of Farm Food Education, Green City Force Americorps members came together for a competition cook off. The challenge was to create an individual salad featuring greens harvested from the farm. Restrictions included no heat and all the tools had to be shared. Within 45 minutes, students harvested greens from Red Hook Houses Farm, cleaned, prepped, and plated their salad. Students used their newly acquired techniques - knife skills, emulsifying, blending, and dressing -- and were judged on presentation, taste, and overall skills. It was challenging for them to work individually, but they had fun and took complete ownership of the skills they learned. The four judges were impressed with their focus and the flavors! Most importantly, these young adults who are serving at Green City Force’s partner farms in the city, are now more confident doing fresh food demonstrations that will help their communities eat and enjoy locally grown, delicious produce. The Sylvia Center’s Summer Volunteer Days take place on Saturdays. Last weekend, 3 volunteers who have been regulars throughout the summer - Violet, Max, and Leo helped with garden tasks in the Learning Garden. They had a great time harvesting kale, cucamelons, green beans and tomatoes. In between, volunteers snacked on tomatoes. Already, they can see the benefits of all the work they put in - new flowers are budding and the beans are growing. It was exciting to see major progress made in preparing the garden for the fall. There is still a change to help out! The last summer volunteer event is on September 29th. In preparation for Art of Cooking, the Sylvia Center is collaborating with multiple chefs for the event coming up in November. Chef Anita Lo made a special visit to the last cooking class in Red Hook’s Miccio Community Center. The last recipe of the 6 week summer class cycle was a delicious vegetable filled quesadilla with swiss chards, corn, red peppers, and cheese. Students cutted the corn kernels off the cob by holding the corn cob securely and cutted the kernels from top to bottom. Red peppers were diced and cilantro was minced. Students were confidently showing their kitchen skills of various knife techniques, teamwork, meal prep, and organization. Everyone gathered at the table to enjoy the food cooked together and shared their favorite dish they make at home. Anita shared her love to cook with what she grows and fishes. She likes to cook all kinds of food, cuisines, but especially what grows in her garden and what she catches! After her visit with the young people, she made a stop to the Green City Force class at the Red Hook Houses Farm. She was impressed with the urban farm and how big okras can get! The farm manager explained her interest in learning how to grow things with different palates of the same items. 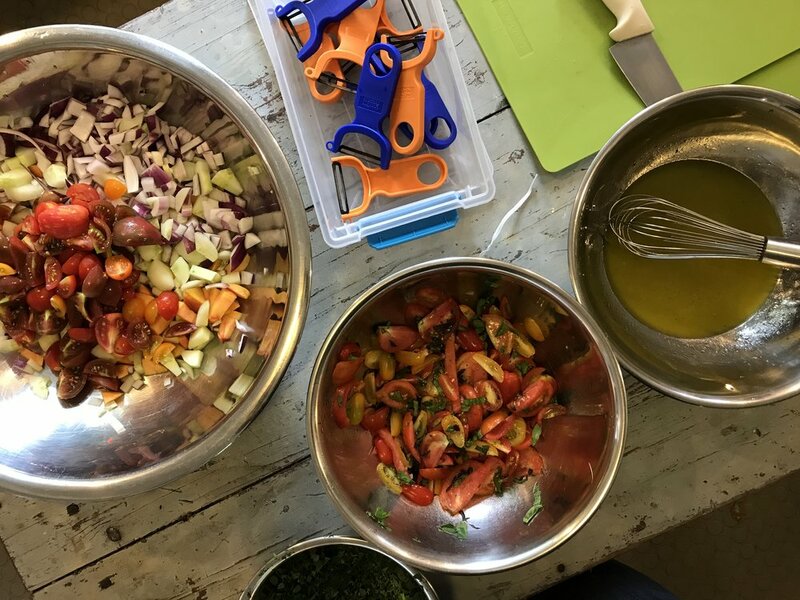 The programs of the Sylvia Center cover a large spectrum within food from learning basic kitchen skills to reaching out to community members on developing healthier eating habits and raising awareness on food systems. From the young people’s cooking class, students are introduced to new flavors to farm food education classes, where young adults continue to grow with food by becoming advocates. 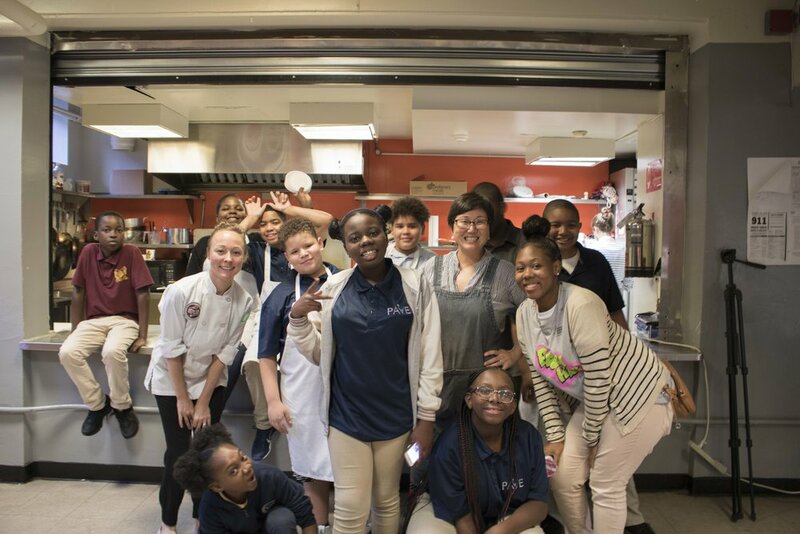 It was a pleasure to have Anita Lo visit and connect with Sylvia Center’s young chefs. We had the pleasure of hosting a work group of cooks from Great Performances late last week. Fourteen of them came and harvested all the ripe specialty hot peppers and one whole row of red field tomatoes. They will freeze them and use them throughout the winter in their kitchen delicacies. They were hard workers, it was a beautiful day and great having them here. Hope you had a Happy Labor Day. On the farm it's not a holiday, it still means work. Ok so we only worked half a day, but we were busy, busy. We started harvesting a couple of beds of chard that surprised us by producing a beautiful second cutting. Chard has the most delightful variety of colors, what a way to start what was to become a scorching 90 degree, hot and humid day. The weather forecast is predicting more of these high temperatures and hopefully without torrential rain, which means Bob has the pump running again and the sprinkler going full blast. He’s also been busy spreading cover crop seed. He’s got to get that seed spread now, so it has time to germinate and begin to get those roots down deep in the ground to pull up nutrients, later when the grass dies those channels will help with water flow and provide pathways for next year’s crop roots. Along with improving the soil it will help prevent erosion and can help with weed and pest control. This week you’ll be seeing the first of our winter squash, hard to believe but the Delicata squash was ripe and ready to harvest. We finished our day harvesting Shishito peppers. These peppers are thin walled & wrinkled, mild when green and slightly sweet when red, great on salads, roasted on the grill or in tempura. The plants are high and filled with fruit so, sitting low on the ground shaded by their leaves to harvest was not such a bad place to be on a hot Labor Day. We all have the power to make healthy choices. Eating fruits and vegetables are essential for our mental and physical wellness. At The Sylvia Center, we encourage our students to take their skills outside the classroom. This summer, we piloted Health Bucks, from the NYC Health Department, in two of our Cooks for Health youth programs. Health Bucks can be used to purchase fresh fruits and vegetables at all NYC farmers markets and provides affordable fresh produce that supports local farmers. Students from West Brighton Community Center in Staten Island and the Boulevard Community Center in East New York were given their Health Bucks to spend during their field trip to their community farmers market. Students from East New York visited East New York Farms (ENYF) and farmer’s market on New Lots Avenue and Georgia Avenue. An ENYF Summer Youth Employee gave our students an engaging tour and introduced students to pollinators, eggplants, and squash. Students were then able to take their Health Bucks to the market and shop with a total of $8 to spend. Watermelons, grapes, garlic, zucchini, cucumbers, carrots and string beans were among the favorites that were taken home. One boy even exclaimed, “I’m going to eat healthy for DAYS!” upon receiving his 1 pound of string beans for $3. Through our Fresh Food Programs, local summer recreation program - Hudson Bluehawk Nation summer camp students made a visit to Katchkie Farm and the learning garden. Young people explored different crops like beans and lettuces and picked their own vegetables. For the hot summer day, they made rustic summer ratatouille and herb cucumber salad. The Sylvia Center trained young adults from Green City Force (GCF) in our Farm Food Educator program this week. GCF’s Americorps members serve at urban farms across the city. The Sylvia Center builds their ability to engage with the community around food and nutrition. In this week’s session, students learned the different vitamins and nutrients that come with eating the rainbow of farm-fresh foods. Beta-carotene comes from orange vegetables such as carrots, sweet potatoes, and butternut squash. Dark leafy greens are high in vitamins K, A, C. Iron is found in purple vegetables. Lycopene is good for the heart and for the blood, and is found in red vegetables. Students also took a closer look at nutrition labels on packaged foods, learning to look for overall calories, and the breakdown of fats, protein and carbohydrates. They are becoming champions of fresh food by sharing their growing knowledge of the principles of healthy eating with people who may not be used to eating a variety of fresh vegetables. It is not as easy as saying “eat it, it’s good!” Students from Green City Force are building the skills, knowledge and confidence to educate and empower the communities they serve through food. Our summer campers were thrilled to learn all about bees from Paul MacPhail of Bee Hollow Farm & Apiary. On Thursday, campers had all of their bee questions answered, made their own beeswax candle, and tasted different types of honeys. They learned how bees are an essential part of sustainable agriculture, and how to be a good friend to bees. Afterwards, campers made fettuccine from scratch with our staff, and the help of local pesto expert and chef volunteer Luca Fontana. Students rolled and cut the pasta dough, and made a delicious traditional pesto with lots of basil from our garden. Everyone enjoyed a flavorful lunch in our field house. The rest of the day was filled with farm chores and improv games. Every summer, The Sylvia Center hosts two sessions of campers in our Young Chefs Farm Camp. Young people, ages 7 to 16, spend all day outside in our learning garden and field house. Campers cook farm-fresh meals and snacks; weed, plant and harvest the learning garden; collect eggs from our coop; and make garden-inspired arts and crafts. Most importantly, they work together to learn where fresh, nutritious food comes from, and how it is the foundation of healthy, lifelong habits. What is the impact of extreme rain on a farm? On a basic level, heavy rain affects a farmer’s ability to do the essentials- harvest, plant, and weed. Thick, deep patches of mud make it extremely difficult for Bob to use the tractor to plant new crops and combat weeds. The rain also limits our farm team’s ability to harvest in the fields. Thunderstorms make that task impossible. One of the most potentially dangerous impacts of heavy rain is soil erosion. Bob spreads compost and the rain washes the rich soil away, nutrients running off like a river from the crops that need them. A neighboring farm had a promising potato crop exposed to the sun due to erosion, causing them to sprout. Ultimately, this will drastically reduce the yield of their crop that was planned months ago. Extreme rain also increases the risk of water related disease and pests. Water molds can spread rapidly in recirculating irrigation water and cause serious damage within a few days. Here at Katchkie, overly wet fields prevented us from harvesting tomatoes until the leaves have dried, so as not to spread diseases. Finally, heavy rain (and climate change in general) impacts the crops themselves. Late summer veggies that thrive on hot, sunny days are not getting their optimal growing conditions. This leads to a later harvest, or potentially, the loss of a whole crop. Keep an eye on your CSA share too. 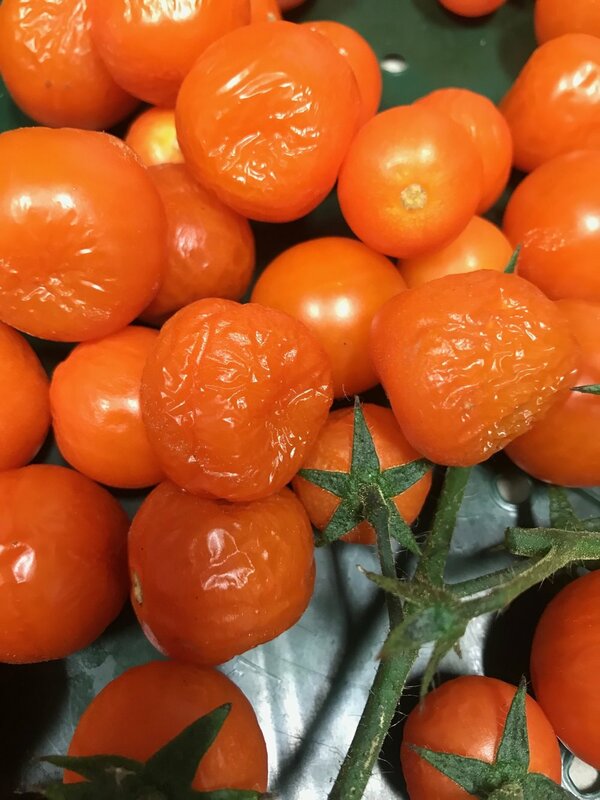 Rain can cause blemishes and cracks in more fragile vegetables, such as tomatoes. Even the taste of the vegetables can be altered by heavy rains! Remember the losses I mentioned due to soil erosion? Imbalanced levels of sugars and important nutrients can alter the taste of the end product too. Such are the challenges of farming! On the bright side, we hope you will be inspired with this week’s harvest to make that special margarita or grab a nice cold beer to go with the Pico de Gallo, or stuffed poblanos or gazpacho we’re certain you’ll be making. Ole'! Young people from North East Community Center visited Katchkie Farm for an experience at the farm and to learn something new! They toured the farm, picked vegetables from the garden, and prepared their own lunch. For lunch, they made summer vegetable & black bean burrito with pico de gallo and a side of summer cabbage slaw. For some, it was the first time to eat the vegetables they picked right from the farm. These vegetables include swiss chard and the summer squash. It was the first time for many things on this visit. Teens tried the edible flower, nasturtium and even learned how to properly hold a chicken! In the city, the Sylvia Center is working on putting together a special video for the upcoming Art of Cooking Gala on November 1st. Over the weekend, a production crew came to capture young people cook live in the kitchen. The video is about the relationship between teens becoming student leaders and building a healthy community. Lay down bed weeder in action! Sugar Babies Watermelons aka "Sandia"
With the massive amounts of irrigating we were doing and the periodic downpours of rain we’ve been having, we are now dealing with an unbelievable growth of weeds. 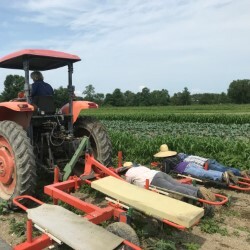 We’ve been using a lay down bed weeder to help us accomplish the task of weeding, making it much quicker and more efficient, saving our backs, hips and knees from many hours of bending, kneeling and crawling which we would have otherwise been doing. Today we discovered our peppers are suffering from an infestation of pepper weevils. We planted more peppers this year than usual so hopefully we will still have a healthy harvest. Finally, we’ve harvested one of our favorite crops of the season, sandia or watermelon, little “Sugar Babies”, averaging 5 lbs. each and so refreshing during this hot time of year. With rain in the forecast, we ended up starting the garlic harvest on Friday. 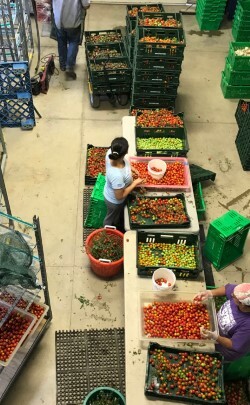 It took us 2 days to get it all harvested and laid out in the greenhouse for drying. Both days were beautiful. Temperatures dropped to tolerable levels-- thank goodness-- and it seemed as if we flew right through the task. It started raining Saturday night, rained again Sunday night and looks like it will continue off and on all week. Time was of the essence. Bob got more fields plowed, seeded and sprayed and my daughters and I canned 2 dozen quart jars of dill pickles. It was a busy weekend. We are now halfway through the season. Four months in and four more to go. Stamina is the word of the moment now. It’s wonderful that the oppressively hot weather seems to have broken its long hold, the rain may alleviate the task of irrigating or at least some of it. I like to think mother nature is watching over us, sensing the limits of our capacity to endure this most difficult life of farming and pitching in to help when she can. PS: If you get some of these over ripe cherry tomatoes, consider yourself fortunate. They are naturally sun dried & the sweetest of natures candy. Try making a tomato pesto with them. To die for!